Eleven years ago, I was a young engineer working in product development, still searching for the right place to put my talents. Although I had been in the women’s health field for a few years I was frustrated that the products we developed rarely got into the hands of those who really needed them – I wanted to see real impact in the areas of India most in need. I met with every single organization that was associated with women, be it finance, be it water, be it climate, and the one thing that emerged over and over again was that all related back to health. Women were very concerned about their own health, the lack of access to health facilities, and the lack of access to health products for themselves, their children, and their families. So, health definitely emerged as the common theme throughout any conversation that I had. My husband and I knew we wanted to create something together, and that it would involve helping women live better and healthier lives. Zubaida Bai in the field. So, we created our company called ayzh (“eyes”) and soon our focus narrowed down from women’s health to maternal health. We learned that approximately 830 women die daily (WHO) from preventable causes related to pregnancy and childbirth, and 99% of all maternal deaths occur in developing countries. It is these statistics, and the injustice and inequality they reveal, that still keep me awake at night, because most of these deaths can be avoided, as the necessary medical interventions are well known. The key obstacle is pregnant women’s lack of access to quality care before, during, and after childbirth. 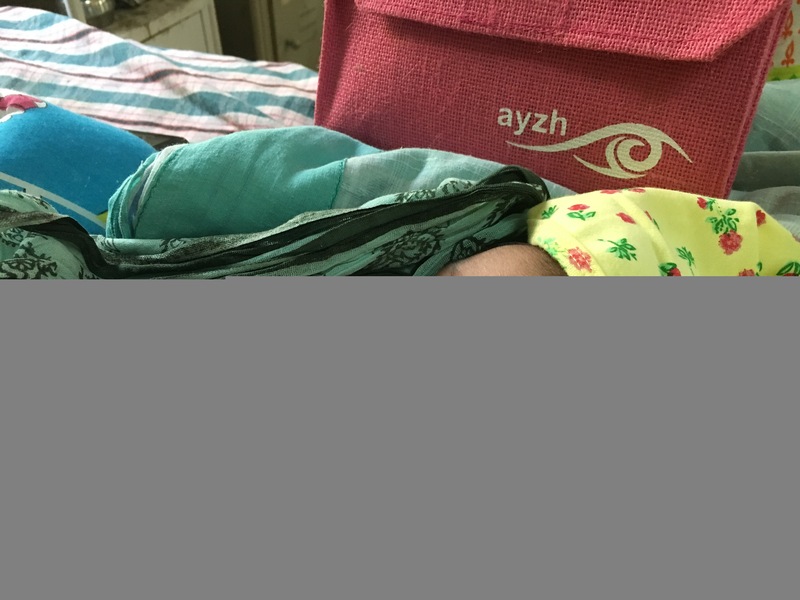 To meet that need we have worked to position ayzh as a social enterprise that develops and distributes low-cost, appropriate technology designed to meet the needs of women and health institutions in low-resource settings. The launch of our customizable “kit style” products, initially our Clean Birth Kit, exemplify a sustainable and scalable model that increases availability and access to proven healthcare tools and best practices. Our expanding product suite addresses the critical continuum of maternal health namely newborn care, postpartum care, and recently menstrual hygiene. ayzh intends to foster integrated innovation across the fields of global health, business, and technology. In the low resource areas, we found that women were giving birth either in a government setting or a poorly-stocked private hospital or clinic, or at home. Most of these hospitals don’t have enough beds to meet the need or steady access to supplies due to supply chain issues. Plus, many of the staff did not realize certain equipment and best practices were absolutely needed for safe births. By understanding the situation on the ground, talking to women and listening to their needs, we came to a conclusion that we had to fix the ecosystem and encourage behavior changes from both health care providers and patients. We developed our first product, the Clean Birth Kit in a Purse, making the delivery of a baby safely sterile no matter the conditions. It was the first of many products we developed for poor rural women and clinics, designed to improve and protect their health and that of their newborns. The components inside the pink jute purse, also called janma, which means “birth” in Hindi, are: an absorbent under pad, a sterile surgical blade, a sterile cord clamp, soap, a pair of gloves, and a baby wiping cloth. Sepsis is the second cause of maternal mortality in Africa and Asia, and the umbilical cord is a potential superhighway for infection if unclean tools are used at birth. Lack of supplies often means, hands are merely rinsed, gloves are used again, a blade is reused. This simple kit, which includes instructions for use, saves lives. Where else is human centered design more appropriate than in maternal and newborn health? My focus has been to think holistically in terms women’s health and their life circumstances. We make an effort to reach out and talk to the women we serve to get a sense of their lives and needs. How were they treated in the hospital or clinic? What were their fears, how much did they know about the birth process? This is part of our promise to bring dignity to the care of poor women. We were happy to hear her say, “Actually I felt very comfortable using the kit. Awareness sessions (given by ayzh) gave me a clear understanding that the kits will prevent all sorts of infection. I was happy that everything was used only for me and then thrown into the waste basket.” She was feeling a bit disappointed, though. “I badly wanted a girl child,” she said. It took six years, three filled passports, and more than half a million air miles to crack open the complex market of government, charities, NGOs, small clinics, midwives, and communicate with a much-neglected segment – the women themselves. With over 350 thousand kits sold we have not only impacted lives of mothers and babies but have also gained tremendous insight into women’s health. We no longer look at maternal health as a single vertical but as an entry point to a broader effect on the lives of women, children, adolescents and by extension their families and communities. At ayzh we are committed to impacting a billion lives by 2030. Watch Zubaida’s TED Talk about the inspiration for her Clean Birth Kit in a Purse.